Home / Get hooked & stay hooked! Get hooked and stay hooked! The title says it all, this is what it comes down in the end. You can have the best of equipment, if your hooks aren’t sharp or good enough, you won’t catch any fish. It’s as simple as it is! An highly underestimated subject if you ask me. It looks so self evident, going to your local tackle store, buy a lure and fish with it, but in fact it’s not. 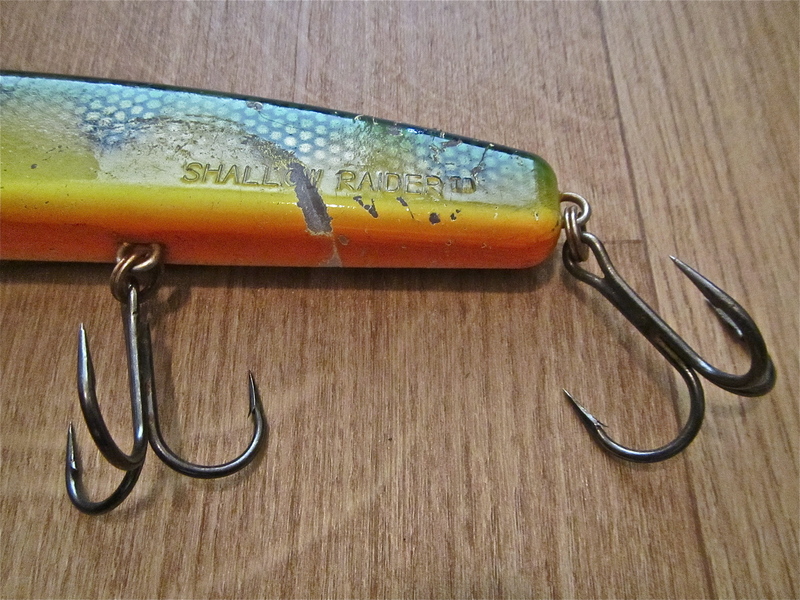 Most lures are equipped with poor quality hooks and splitrings. Not a coincidence, because putting high quality components on them, brings up the price quite a lot. But why? It’s certainly annoying, loosing a fish due to poor quality components on a lure. That’s not why most of us go to the water, you go fishing because you want to catch fish right? And you buy a lure to catch on it! When you, like me have such a tremendous amount of lures for use in your collection, you know what’s going on. Most well known Esox lure manufacturers are in my collection. It always suprises me, or should I say not surprises me, that the USA brands carry the best equipment in their arsenal. And that here in Europe, it’s completely the other way around. Nearly all of the lures that comes from the USA are equipped with high quality components like it should. Fishing for Muskie is not a joke, and you need the best of the best. Brands like the Suick Lure Company, Joe Bucher, Drifter Tackle, Musky Mania, Grandma Lures, Musky Armor, Bondy Baits, Bikini Bait Company, Musky Innovations all carry these. So when it comes to hooks and splitrings, what exactly do we want them to do? Splitrings are attached to a lure to ”carry” the hooks. They come in all kind of different shapes and sizes. There are oval splitings on the market, double wired round, and the famous triple splitrings, wich can withstand the toughest beating of any fish that hits your lure! 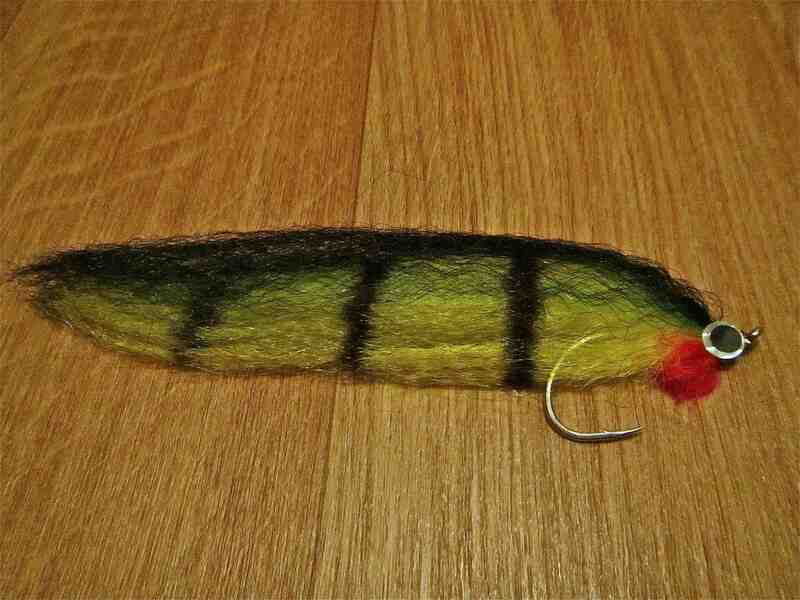 Most Musky lures come with triple splitrings, like the ones made by Drifter Tackle and Musky Mania. They are ready to fish out of the box, and don’t need any modification to them. If you buy for a ‘Lil Ernie for example, you may notice that it comes with triple splitrings, and high quality razor sharp trebles that will not bend and stay hooked when it comes to catching fish. Trust me I’ve been in that situation many times, where the hooks would bend out like a straw resulting in loss of fish. Triple ”Wolverine” splitring on a Fatso 14. Let’s take an example of what is possible one of the best lures ever produced, the Salmo Fatso 14, the tail end of the lure as pictured above. Over the years Salmo has some up with many different types of this one. No, the lure always stayed the same, but colour would vary, and what probably surprised me the most, was the fact that each time different packages showed up in my local tackle store, and the lure was equipped with different hooks and splitrings each time. I’m not sure if you can remember, but one of the actual first Fatso’s produced, had a black round circle on one end of the lure, in wich the Salmo logo was shown. More than 10 years easily. The lure itself has never let me down, but the terminal tackle has. Poor quality splitrings and hooks resulted in loss of big fish. If you’re like me fish on the river alot, you know what your’e dealing with. 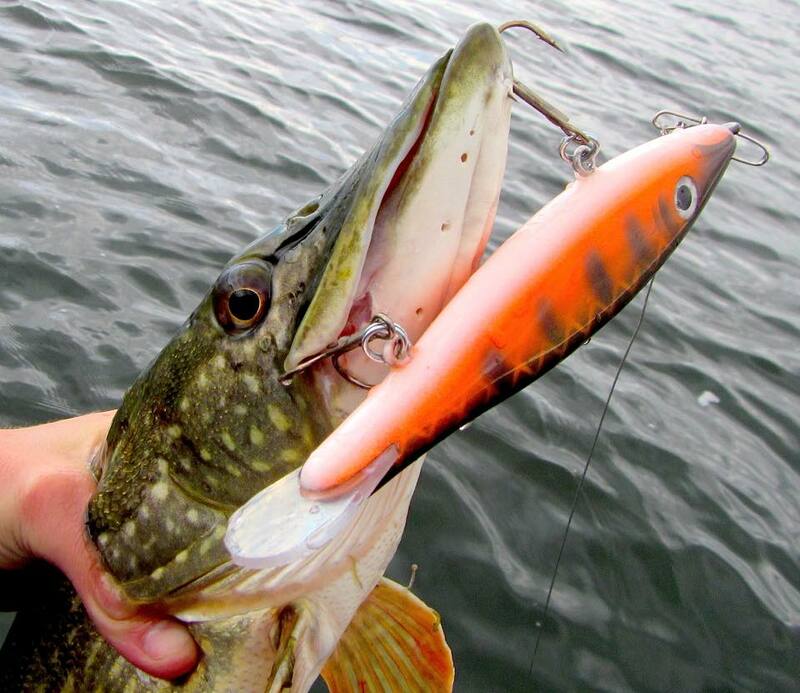 Pike hit lures like maniacs, the force that they have when hitting a lure is out of this world, and cannot compare to anything else. Even the small ones hit a lure like there’s no tomorrow. I still don’t understand why a respected company like this would save on this. I remember when fishing the river one day, in the early Fatso days, when I got a real big fish on. I felt the strike all the way, and was left with only guessing what had hit my lure, cause the hooks were completely gone! That’s right, both hooks! As a result to this I decided to put on some 300lb splitrings made by Wolverine Tackle to be sure that this wouldn’t happen again. If you have bought yourself a new lure from your local tackle store, and want to find out wether your splitrings are strong enough, there’s a simple trick to get to know this. Grab the lure by the end of it’s tail with your left hand, and with you other you will hold onto the rear treble. Now hold the lure steady in your lefthand, and twist with your right hand on the treble. You will notice that when you do so, you’ll be able to somehow twist the splitring. If you use a fair amount of strength to do this, poor splitrings will bend out, good ones do not. It’s a simple trick, but enough about splitrings, let’s talk about hooks! Hooks and splitrings from Joe Bucher, one of the best! 90% of all my lures are equipped with Gamakatsu trebles. And for a good reason, they’re the sharpest in the world, and will hook the most fish! They last long, and withstand against rust with ease. They’re not cheap, but you shouldn’t save money on this! I use them in all kind of different sizes but the one’s I use most are the Treble 13 in 2/0 and 3/0. These are the most powerfull trebles money can buy. I’m a big fan of using the 3/0 for allmost all my gliders. Why this big? Because you want to catch fish! Gliders carry their name for a good reason. They glide from left to right by each pull of the rod. If you have ever fished with one, you know what I mean. It’s hard for a Pike to decide wich direction it should aim when hitting the lure, and it occurs quite often that they simply miss the lure, because it whent left, instead of right when they decided to go into attack modus. If you take a Buster Jerk for example, you may notice that it comes with great quality splitrings, but with poor quality hooks. The hooks are simple way to small for this type of glider style jerkbait. They’re also not sharp enough, and the wire material is way to thin, so they will easily bend out. I immediately trew away the existing hooks and replaced them with a pair of Treble 13 3/0. 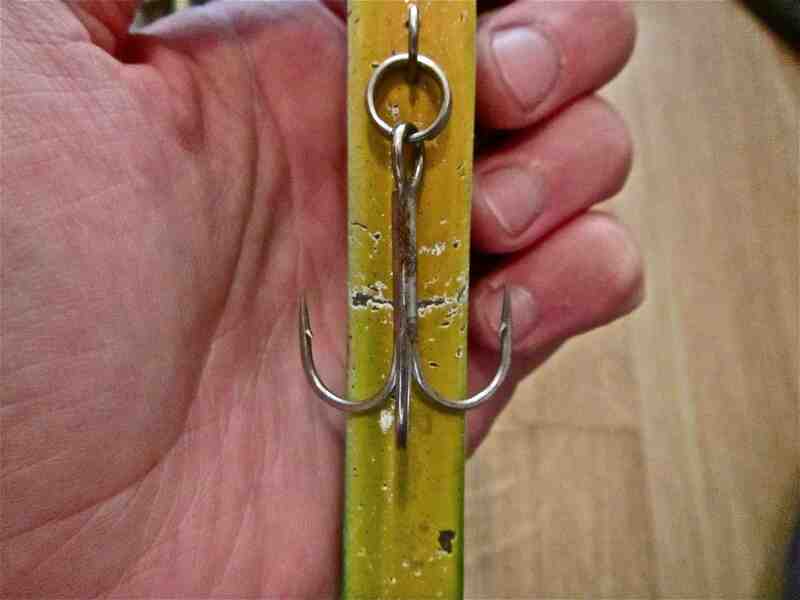 A good thing to bear in mind when attaching hooks to any kind of lure, that they are wide enough, wich simple means the hook points reach outside the lure it’s body as pictured below. Treble 13 3/0, the perfect hook for a Buster Jerk! As you can see on the Buster Jerk in the picture above, it’s hooked alot of fish thanks to high quality trebles. On this particular treble occurs just a little bit of rust, but that’s normal because iron and water work that way. One thing I do tough, is after a fishing day, storing my boxes away with the top open, so the hooks can dry from a day of fishing. In the hook manufacturing business there is alot going on when it comes to competition amongst company’s. Quality has a name as I already mentioned with some brands above. 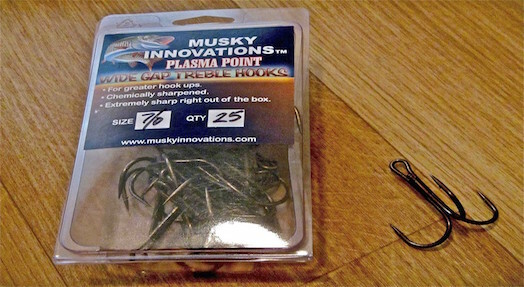 People often say that hooks provided on most USA brands are not suitable for Pike fishing, and they need to be replaced. They are too thick or would damage the fish it’s mouth too much. I disagree. Don’t go fishing if you think like this. Most hooks are on there for a reason. Let’s take an example like the Suick Thriller. This jerkbait style lure is equipped with 3 4/0 trebles. Way to much you could be thinking. But if you take away the middle treble, you take away the lure’s action as well. There are many lures on the market that are balanced this way, so making a change in hooks can cause a different action. Therefore you should always keep in mind, when replacing hooks, that you replace them with ones that hook kinda identical to the ones that already existed on the lure itself. Barbless hooks are NOT recommended when it comes to lure fishing. You go onto or near the water to catch fish, and with barbless hooks this part is reduced by 80%. You will loose fish, no matter what they say. Hooks with barbs stay hooked in the fish it’s mouth, hooks without don’t and wiggle around more. On the other hand, when you hook yourself, it’s easier to get one out and you don’t need to go to the hospital. But than again, this only happends on a rare occasion, and that’s the risk I take, when not wearing my gloves. Beside sharpness and size, there is one more important thing that you should keep in mind when buying hooks, they should be strong enough to handle the pressure of big fish. This however also depends on how your reel’s drag is set, and wich rod you use. If you use a stiff rod and a reel with it’s drag set to zero tolerance, once you hook a big fish, the hookpoints will bend guarenteed. I wouldn’t say totally straightened but surely enough to loose one. A big water streamer made on an offset hook! When it comes to Fly-Fishing for Pike, this opens a whole new chapter. Here the hook fills in another job, wich is transportation of materials tied onto the fly. 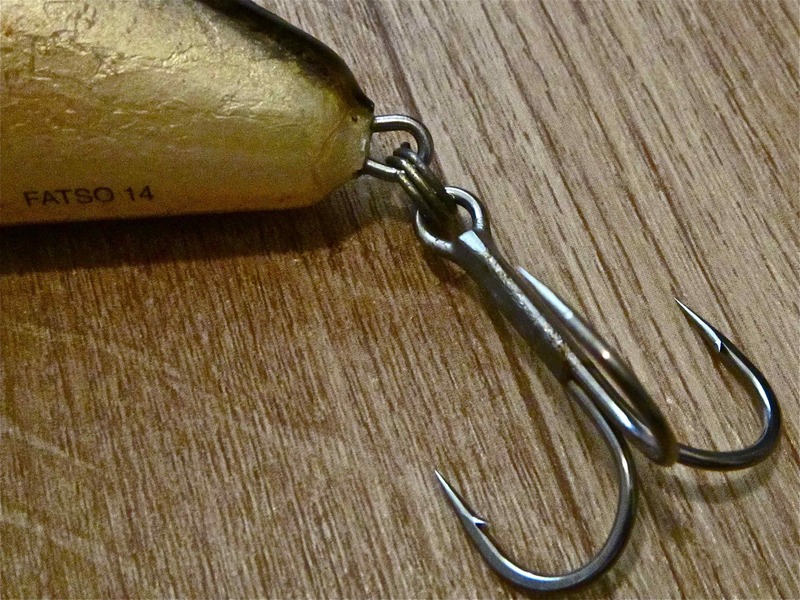 Because the pressure of any hooked fish is now located on a single hook, instead of a treble, it needs to withstand more beatings and needs more strength. Again, for flies I use either a quality Partridge of Redditch hook, or a Gamakatsu one. For my Fly-Fishing in canals I like to use a Gamakatsu 6/0 and for bigger water an 8/0 or perhaps a 9/0. Big hooks are used mainly because we only fish with one hook now onto the fly, and you will need to have the most hooking percentage when a Pike decided to attack the lure. Also the hook should be sharp enough, but that’s clear by now right? There are many hooks on the market when it comes to Fly-Fishing for Pike, and many are not suited, because they all are straight. Straight hooks will guarenteed cost you more fish than let’s say offset hooks. With an offset hook, the hook point, as the name already says so, is positioned in a slightly ”offset” angle to the hookshank, wich will result in greater hookups, and can be equally related to a treble. The fly above is tied on such a hook. It’s kinda hard to take a photograph this detailed, so I took a picture of the whole fly. It’s the big water EsoxOnly Perch, with a strong and razorsharp Gamakatsu 8/0 hook. Guarenteed to catch fish! Hooks, splitrings, two most important thing of your equipment, Don’t take any compromises, go for the best. It will certainly improve you fishing for Pike & Muskie. You can have the biggest boat, the most expensive rods, in the end it all comes down to one thing, wich is get hooked, and stay hooked! A nice fish on a Bikini Bait Company TurmoilX glider, the right hooks did the job!